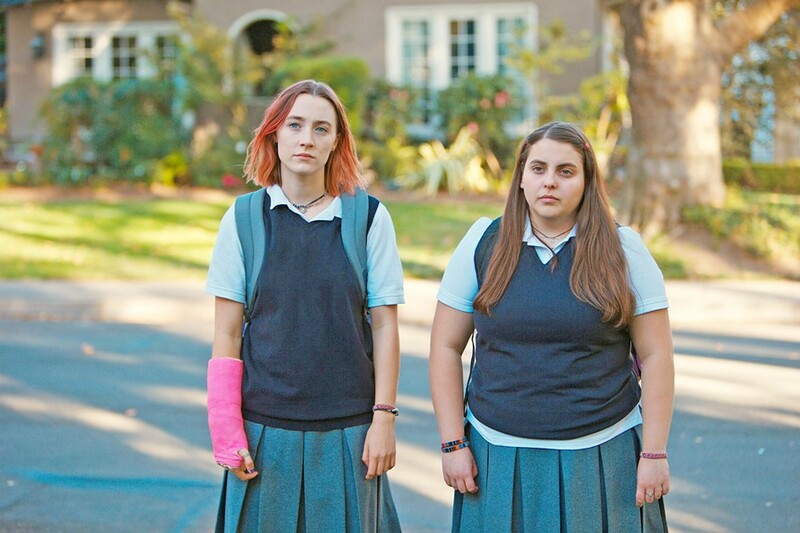 DREAMERS Besties Lady Bird (Saoirse Ronan, left) and Julie (Beanie Feldstein) dream of living in some of the fancy houses they see on their walk home from school. Glen I've got a mom and two sisters, so I'm well aware that mothers and daughters can have very complicated relationships with one another, and that's certainly the case here. Marion loves her daughter and wants what's best for her, but she's extremely judgmental and frequently unsupportive of Lady Bird. Likewise, Lady Bird loves her mother but feels completely misunderstood, and she's abrasively dismissive of her mother and her provincial ideas. One key scene finds them bickering bitterly in a secondhand store while searching for a dress for a dance. One second they're at each other's throats and then Marion pulls a dress from the rack and they both swoon over it like they're not in the midst of an argument. Theirs is a mercurial relationship that turns on a dime, but beneath the acrimony is a deep connection. It's senior year, and Lady Bird is finding romance with Danny O'Neill (Lucas Hedges) and joining theater with her bestie Julie (Beanie Feldstein). Naturally things go awry, and soon Lady Bird is pining over musician and anti-capitalist Kyle (Timothée Chalamet) and ingratiating herself into the life of the super popular Jenna Walton (Odeya Rush). Gerwig perfectly taps into the floundering, insecure feelings of adolescence, and watching Lady Bird traverse the difficult terrain of this coming-of-age story is entertaining, joyous, and ultimately poignant. Anna Gerwig hit the nail on the head when it comes to writing women, especially Lady Bird, who is all things teenager. Ronan pulls off that awkward somewhere-in-between-girl-and-woman stage that we all suffered through in high school. Everyone has it better than her, and she gladly tells some people she lives on the wrong side of the tracks, while trying to impress others by telling them she lives in a fancy, huge house that really belongs to Danny's grandparents. She is suddenly "too cool" for her childlike best friend Julie, yet pines for her desperately when the "cool kids" wind up being pretty lame. 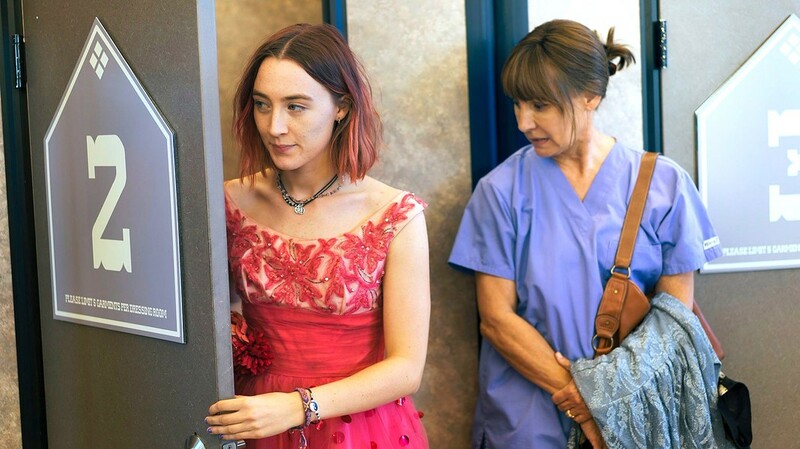 When the film opens she's in an argumentative tête-à-tête with her mother about going to the East Coast for college instead of nearby Davis or the local J.C. Lady Bird will do anything to get out of Sacramento, a town she claims to loathe but that also offers her the comfort of familiarity. When her mother adopts a "this is the way it's going to be" approach to her side, Lady Bird simply throws open the door of the moving car and rolls herself out. Cue pink arm cast for the rest of the film. Metcalf as Marion is impressive and the relationship built between the two women is complicated and unsure. We all know our mothers love us, but do they like us? This is what Lady Bird needs to know, and the fact that Marion can't give her a resounding "yes!" speaks volumes about the nuanced relationship between mothers and daughters, especially in those last moments before moving on to the next phase of life after high school. Glen The acting really does shine here, probably because Gerwig is first and foremost an actor herself, having appeared in a lot of wonderful indie films such as Damsels in Distress, Frances Ha, and Maggie's Plan as well as some bigger films such as Jackie and 20th Century Women. She gets wonderful performances out of her two principals, but I thought Feldstein as Lady Bird's awkward friend Julie—who's secretly and hilariously in love with her math teacher Mr. Bruno (Jake McDorman)—was a real standout. Feldstein morphs herself into an awkward wallflower. One of the things the film does well is capture what a weird time high school is. It's like a bubble of unreality. Insecurities rule the day, and in general high school students have no idea that most of the popular kids have peaked and will grow up to be unhappy losers while the misfits inherit the earth, but as viewers we can see the writing on the wall. Jenna may be pretty and perfect, but she's destined to be a trapped housewife who'll forever try to recapture her glory days. Kyle may now be mysterious, edgy, and cool, but he's a pseudo intellectual who'll end up a bitter lifelong barista or bookstore clerk who felt life cheated him. Maybe Lady Bird won't fare much better. Maybe she doesn't have the aptitude to be an artist or a writer. What the film makes clear is that Lady Bird learns what's important and learns to be a good human being. That's pretty much all anyone can hope for. PRETTY IN PINK Lady Bird (Saoirse Ronan, left) must navigate adolescence as well as her overbearing mother, Marion (Laurie Metcalf).